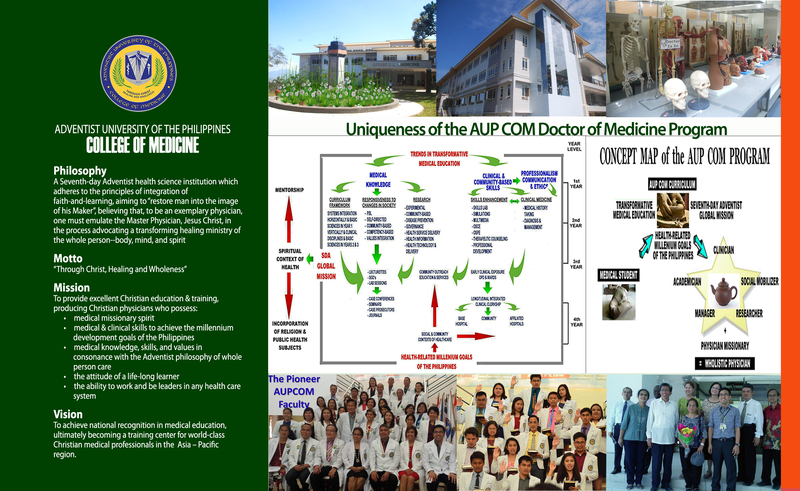 The Adventist University of the Philippines College of Medicine (AUP COM) is one of the six medical schools run by the Seventh-day Adventists (SDA) worldwide and is the newest addition to this assembly. The other SDA medical schools are the Loma Linda University School of Medicine in Loma Linda, California, USA; the University of Montemorelos School of Medicine in Montemorelos, Nuevo Leon, Mexico; the River Plate Adventist University School of Medicine in Libertador San Martin, Entre Rios, Argentina; the Benjamin S. Carson School of Medicine of Babcock University in Ilishan-Remo, Ogun State, Nigeria; and the School of Human Medicine of the Peruvian Union University in Nana, Lima, Peru. For clinical exposure and experience, AUP COM students will be rotating at the Batangas Medical Center in Batangas City, the Adventist Medical Center Manila in Pasay City, the Cavite Center for Mental Health in Trece Martires, Cavite and in selected communities of Pasay City, Cavite, and Batangas. As a Seventh-day Adventist Health science institution the AUP COM adheres to the principles of integration of faith-and-learning that aims to “restore man into the image of his Maker”. It believes that, for one to be an exemplary physician, one must emulate the Master Physician, Jesus Christ and in the process advocating a transforming healing ministry of the whole person-body, mind and spirit. Possess all essential medical knowledge, skills, attitude, values and professionalism, in consonance with Adventist philosophy of whole person care. Possess the ability to work in and be leaders in any health care system, in the present time and in the future. 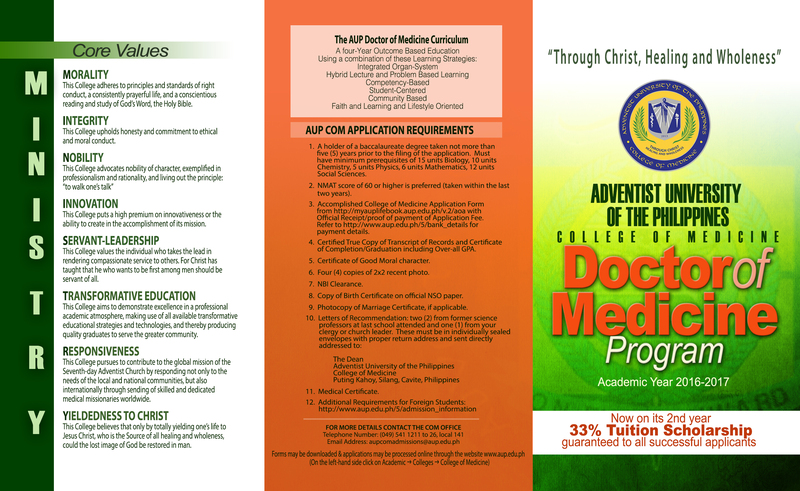 The AUP College of Medicine aspires to achieve national recognition in medical education and social service ultimately becoming a training center for world class Christian medical professionals in the Afro-Asia-Pacific region. Develop in the students such habits and attitudes that will enable them to engage in lifetime continuing medical education responsive to changing needs and developments.